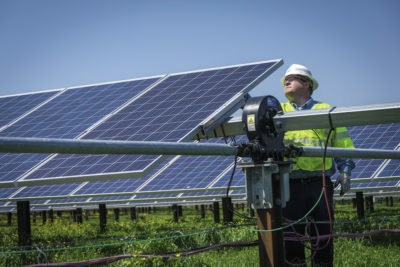 An increasing number of U.S. utilities are embracing the low and predictable costs of utility-scale solar. But conflicts remain over distributed generation, and the real question is who will own the solar that is being built. Continue reading. Another Utility Bets Billions on Renewable Energy, The Motley Fool. AES will spend more on renewable energy projects in the next three years than on fossil fuels, a huge shift for the coal giant. This entry was posted in NewsBlog and tagged corporations investing in renewable energy, Electric Vehicles, global renewable energy development, Nebraskans for Solar, renewable energy news, utilities investing in renewable energy on November 13, 2017 by Helen Deffenbacher.